Posted byAnn-See Yeoh	 October 3, 2013 1 Comment on Stoptober! OK … I know it’s about stopping smoking, however, I feel it’s a great focus for this month on and off the yoga mat and it is interesting as the campaign states that if you stop for 28 days, you are five times more likely to stay smoke free. There has also been research that indicates that it takes at least 21 days to instill a new habit; although this figure changes from research paper to research paper. Suffice to say that if we want to create a new habit, we will need at least 3 weeks. On a side note, I remember speaking to the vet about how my cat would react if I got a kitten. His response was to allow her 21 days to adapt as it takes cats 21 days to form a new habit, and introducing a kitten to her life was messing up her daily routine. So, bearing that in mind, let’s apply Stoptober to life on and off the mat. It is easy to fall in routine in life and live out of habit. We develop habitual ways of living and thinking. Question is, have you ever stopped to wonder if such habits are serving you? I always remember my yoga teacher saying that yoga is about breaking habits that don’t serve us and developing new ones that do. Whilst you may already know what you would like to change/stop, if you don’t, then rather than rush into Stoptober by choosing the first thing that comes to mind, take your time to peel back the layers and determine what really isn’t serving you right now. If you’ve decided that it’s a “physical” habit that you want to stop, e.g. smoking, chocolate, ask yourself what need is that physical act fulfilling. Some people may find it really easy to just stop. For others, it may help to understand what the underlying need and by establishing that, you may be able to create a new habit that more helpful and positive instead. 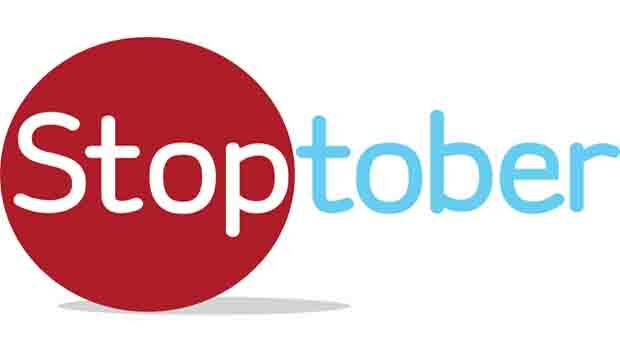 What is my Stoptober focus????? To stop being so hard on myself. Yes, I can struggle with doing a morning yoga practice. So I find myself procrastinating. I don’t do my yoga practice. I veg out instead of training …. and then, I feel bad and I beat myself up in my head. What I realise is there is a time and place for everything and we need to just let things be sometimes. I remember reading somewhere that life should not feel like an uphill battle, or that you are constantly struggling against the tide. Life should flow and I know that the reason I am hard on myself, is the voices in my head that tell me that I need to be the best, or I’m not good enough. That doesn’t mean to say that I won’t get things done still. What new habit are you going to embrace this Stoptober? I love this. I stopped watching TV this month. It was a nightly habit I am trying to break. Way overdue. So far I love it. I also am doing the UBC so this frees up time to do it!